August 15, 2018, 3:30 p.m.
CoverGirl’s latest collaboration with writer, actor, and producer Issa Rae, best known for the popular web series Awkward Black Girl and HBO&apos;s Insecure, appears to be spurring conversation. New numbers from YouGov BrandIndex suggest that more US women aged 18-34 have recently reported talking about CoverGirl than at any time since YouGov began tracking the makeup brand in 2007. 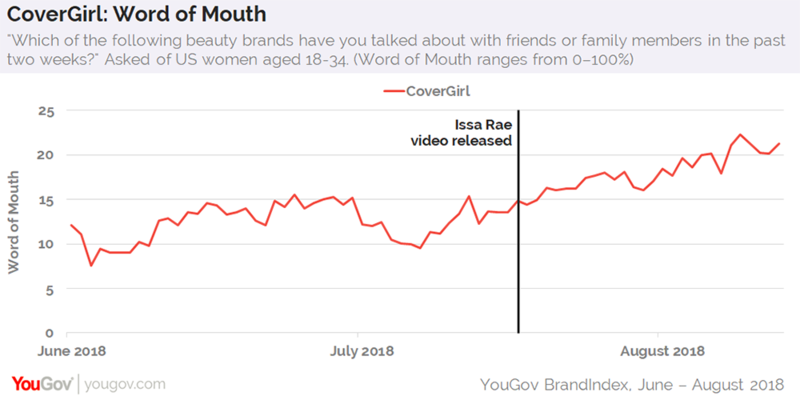 Following the July 17 release of Rae&apos;s video campaign titled Shade for Shade, which promotes CoverGirl’s 48-shade Exhibitionist Lipstick collection, the brand’s Word of Mouth metric climbed seven percentage points from 15% to 22% among female millennials, meaning over one in five had discussed CoverGirl with friends or family members in the past two weeks. The two-minute spot featuring Rae joking around with friends and applying lipstick was covered by publications such as Allure, Elle, and Essence, likely amplifying its reach. According to data from YouGov Profiles, 37% of female consumers aged 18-34 have a positive impression of CoverGirl, while 5% hold a negative impression and 41% take a neutral stance. Further figures reveal that 69% of current and former CoverGirl customers use beauty products to make themselves feel better, compared to 61% of all US women. At the same time, 77% of current and former CoverGirl customers disagree with the statement, "Personal appearance is not important in society today," compared to 72% of American women in general. 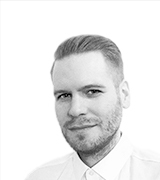 Contact us now to track your brand metrics - and your competitors’.